Things are going good here. My back is a bit sore. But other than that…I’m happy that I’m working on page 9 already. Also. I’ve added new music to the Jukebox. So sorry it took so long to update. Oh…and some of you have asked that I document which songs I’ve had on the Jukebox in the past. So…there’s a post below that details that. Other than that…everything is going great. I’m so happy to be working on Dreamland again. The boys get out of Kindergarden in a few weeks. And I’m starting to feel better. What more could we ask for. I hope you’re all enjoying the story so far…and welcome to all of you new readers who’ve posted “hellos”. I am so glad you found us and so glad you enjoyed Dreamland so far. I thought it would be cool for you to see a close up of panel 2. You can see Orion in the reflection of Alexander’s armor. As well as the wierd image wrap of the sky (where the picture ends and starts repeating itself on the right). Ha ha. It’s cool…but now that I’ve shown you…I have to clean up that sky problem. is it me, or is alex not being smart… not that he is super smart most days anyway…. geez…. I love Alex’s expression in the last panel! Step one in learning to fly: Get subject to convince himself that certain death if pushed off a cliff is improbable. It seems to be working, though not quite the hitchhiker method. correct me if I’m wrong but did you just give us an extreme close up of the texture seam on the centaur’s headpiece? Ok, so, let me guess, Alex is actually going to jump off, on his own! Yes. That’s the back of Orion’s head piece in panels 1,2, and 4. Oh geez. He’s seen the Matrix too many times…! Orion’s going to shove him off just for being a smart-aleck. Waiting till Wednesday is going to be painful, isn’t it? Is he going to go all Vizzini on us? Why would he bring him to the top of a giant cliff just to say, “If you jump off this cliff you will die”? Actually this comes to an important point. Can people actually die in Dreamland? It’s not exactly a common thing for a 6-year old kid to suddenly croak in their sleep. Wow that reflection in the armor is so cool! hehe…. I think he’s going to Jump off the cliff to call the centaur’s bluff and then force himself to either wake up before he hits the bottom, or fly. I remember thinking that I must be dreaming, but even dreams couldnâ€™t be this real. I remember touching the tips of clouds amazed at how different they all feel. I remember seeing the tops of trees and the surprisingly cool summer wind. I remember guiding snowflakes all the way to the ground on raise up and do it again. I remember racing with eagles high above rocky plains. I remember swooping down with the seagulls trying to catch fish but it was all in vain. I remember barely avoiding big branches when I decided I should chase the hawk. I remember the threatening glares I received when flying south and I tried to lead the flock. I remember clearly understanding the metaphor, â€œhaving a birdâ€™s eye view,â€ and laughing as the thought sunk in. I remember the horrible taste as I yawned and swallowed a bug caught in the wind. I remember seeing stars that were so close I thought I could touch them, shining brightly in the darkened night. Yes I remember what it was like to fly, and again itâ€™s time for me to take flight. The shine on the armor is awesome! My forehead hurts from where I slapped it. Man, Alex can be really um… well… he takes things too literally sometimes. My online friend got me hooked on this. Thank you for making such an amazing webcomic. In the last panel, he looks like he’s leaning backward a bit…watch out! I’m guessing our very wise centuar friend is more patient, but I probably would push him off while telling him what I’d Actually wanted to do originally. The thing that bothers me about this is Alex doesn’t seem to be maturing as I think his character would be. He is going through a a lot of life and death scenarios. Additionally he is in love and his love is looking up to him – and she’s a pretty smart and competent person. I would see him trying to be his best for her if no other reason. I just don’t see him being able to maintain being a slacker realistically. I think he would be motivated to be more. As I undersand what his nephew said, He can’t fly if he’s scared. 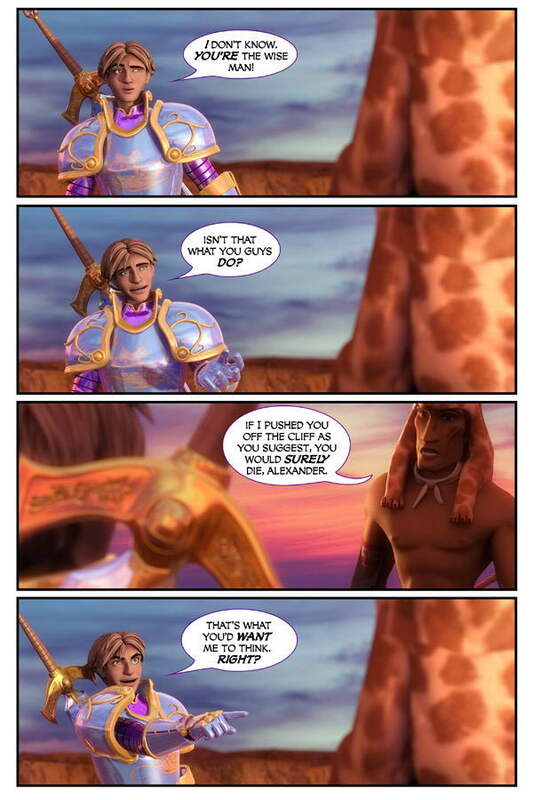 So he has to be convinced that he won’t die so he won’t be scared enough to wet his pretty armor. Then with some imagination, he can fly. Second star to the left and straight on till morning. You’re right. This chapter tackles that issue. I promise. Welcome back. Thank you for the wonderful Poem! I love this comic so bad. Found it yesterday, read it to this point a second ago. Can’t wait to get some more ! Hey Blaz, keeping in mind that in the “real world” Alex is still a college student! Take it for what its worth..
Scott I love this comic so much, I read alot of webcomics, ctrl+alt+del, penny arcade, dueling analogs, etc. but this is the only comic that truly makes me care for the characters as if they were real people. Nicole’s realization of Felicity being taken from her as a child was heart wrenching but at the same time up lifting because she’s finally starting to believe. P.S. Alex is a little slow on the up take, but that’s what makes him so lovable. As I said before, you keep up the amazing work and I’ll keep reading and waiting for the next page. Uh oh! Alex better not try to be thinkin he’s going to be out smarting that ‘wise old man’ by jumping off himself.. :P! Thank you both so much. Welcome to Dreamland….and thank you for reading and dropping by and saying hi. So glad you both enjoyed the story so far. I hope you continue to enjoy it as I get back to 5 days a week. Erm, not to sound picky or anything, but what is sticking out of Orion’s right arm in the third panel? That’s his staff. The one he’s been holding. You’re just seeing the back of it behind him. Alex just has to remember that he is no longer in the real world, and that he can do anything that he might imagine. Well, not quite anything, but most things. Oh goodness.. Alex, you just go on ahead thinking the whole world is out to get you – because it is, and you’re falling for it hard. If the wise guy pushed him off the cliff wouldn’t his armor save him? Yeah, so I’m guessin’ he’s not gonna be able to fly till his or Nastajia’s life is in danger in the end of the big fight at the end of the series, as the cliche goes. And aside from that, Great webcomic Scott! I’ll pray for your back to heal! Oops, I meant his right. It just looked as though something was intersecting the bicep there. About 75% to the right, and near the bottom. A plane or something, but it could just be the play of light from the background. I’m sorry. I don’t suppose Alexander is immortal..still in dreamland you never know just like you never know whether or not you are going to succeed with custom term papers cheap service.